dannyman.toldme.com : We are the supermen . . . This is the best expression of the civilization in which the white race finds itself today. 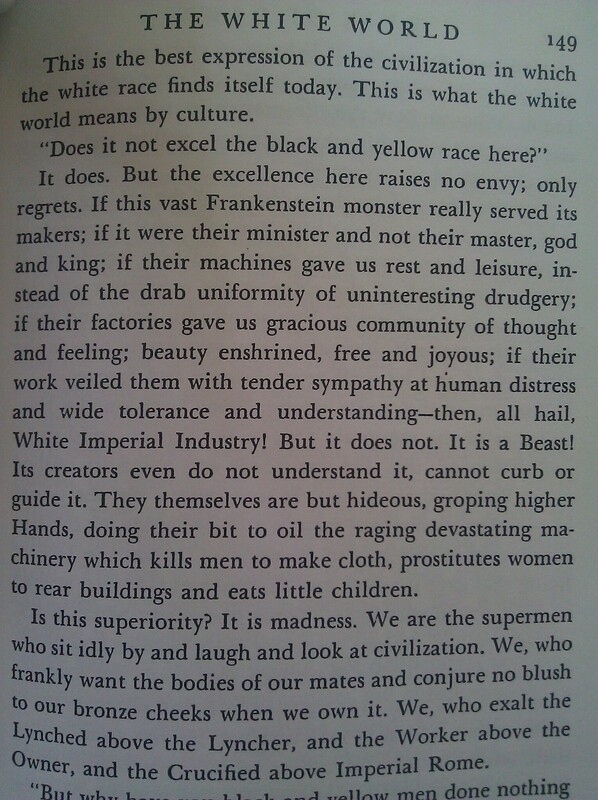 This is what the white world means by culture. It does. But the excellence here raises no envy; only regrets. If this vast Frankenstein monster really served its makers; if it were their minister and not their master, god and king; if their machines gave us rest and leisure, instead of the drab uniformity of uninteresting drudgery; if their factories gave us gracious community of thought and feeling; beauty enshrined, free and joyous; if their work veiled them with tender sympathy at human distress and wide tolerance and understanding — then, all hail, White Imperial Industry! But it does not. It is a Beast! Its creators even do not understand it, cannot curb or guide it. They themselves are but hideous, groping higher Hands, doing their bit to oil the raging devastating machinery which kills men to make cloth, prostitutes women to rear buildings and eats little children. Is this superiority? It is madness. We are the supermen who sit idly by and laugh and look at civilization. We, who frankly want the bodies of our mates and conjure no blush to our bronze cheeks when we own it. We, who exalt the Lynched above the Lyncher, and the Worker above the Owner, and the Crucified above Imperial Rome. You are obsessed by the swiftness of the gliding of the sled at the bottom of the hill. You say: what tremendous power must have caused its speed, and how wonderful is Speed. You think of the rider as the originator and inventor of that vast power. You admire his poise and sangfroid, his utter self-absorption. You say: surely here is the son of God and he shall reign forever and forever. You are wrong, quite wrong. Away back on the level stretches of the mountain tops in the forests, amid drifts and driftwood, this sled was slowly and painfully pushed on its little hesitating start. It took power, but the power of sweating, courageous men, not of demigods. As the sled slowly started and gained momentum, it was the Law of Being that gave it speed, and the grace of God that steered its lone, scared passengers. Those passengers, white, black, red and yellow, deserve credit for their balance and pluck. But many times it was sheer luck that made the road not land the white man in the gutter, as it had others so many times before, and as it may him yet. He has gone farther than others because of others whose very falling made hard ways iced and smooth for him to traverse. His triumph is a triumph not of himself alone, but of humankind, from the pusher in the primeval forests to the last flier through the winds of the twentieth century.